TGCET 2018 3rd phase 5th Class Admissions counselling, Certificates verification dates, School wise Provisional list, TGCET 3rd phase Admissions counselling 2018. Candidates are shortlisted in the ratio of 1:3 for the available vacancies in Class V for Admissions through Counselling. TGCET 5thclass entrance test 2018 2nd phase certificates verification dates, TS Gurukul CET 5th class 3rd pahse admissions counselling dates. List of documents for 3rd phase TG Gurukul CET Certificates verification, 3rd phase TGCET 2018 Results or School wise Provisional list(School wise alloted candidates lists) of Telangana Gurukul CET and more details are given here. The following guidelines are issued for 3r phase counseling for filling up of the vacant seats in Class-V after completion of 2nd list of admissions. 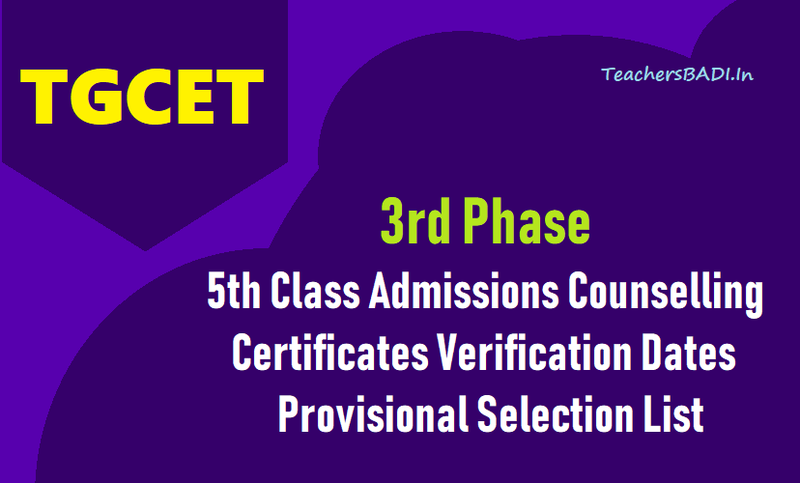 TGECET 2018 5th Class Admissions Counselling for Admissions into Class-V for the Academic Year 2018-19. TREIS has to be Conducted the Final Counselling for filling up of left over Vacancies of V Class. The Common Admission test TGCET 2018 that was conducted for admission of students in Class V in all Residential Educational Institutions Societies. 02 Phases are completed by the convenor TG-CET. After phase-2 admissions counselling, the Convenor has informed all the Societies to take up the next phase of admissions to fill up the remaining vacancies by each Society and he has furnished the leftover merit list to the Society. Further, TREI Society has short listed the candidates as per the merit and rule of reservation in the ratio of 1:3 for the available vacancies. List of shortlisted candidates is enclosed here. 1. Candidates are shortlisted in the ratio of 1:3 in each category. Candidates are informed by this office through SMS to attend for Admission counselling on 25.07.2018.
vacancies may be filled under Open Category. 3. If sufficient candidates are not available in BC-C then such vacancies may be filled by BC-D candidates. Similarly in the case of BC-E vacancies they may be filled by BC-A candidates. 4. If no ST/SC candidates, vacancies are converted to SC/ST. 5. Before selecting the candidates, verify the certificates like Reservation category/Income /DoB/Study etc. Follow the rules before giving admission card to the Student. 6. As the candidates are called in the Ratio of 1:3 , some of the candidates may not be accommodated. In such case, list of interested candidates who do not get the admission in the present counselling may be called if the vacancy arise in future. 7. List of Short listed candidates is enclosed at Annexure. Hence the Principals of Counselling Venue Schools are hereby informed to fill up the vacancies from the short listed candidates enclosed with these proceedings duly following the admission Rules of the Society.